Nearly a year ago a controversial study was published in the peer-reviewed journal Cancer. Conducted by Dr. Elizabeth Claus, the lead author and a professor at Yale School of medicine along with a team of researchers, the study suggested that dental X-rays may increase the risk of brain tumors. Though the study seemed thorough and the results plausible, it was called into question by numerous medical professionals and the American Dental Association (ADA). Why? Because during the study, the researchers relied solely on participants’ memories and did not review any dental records. 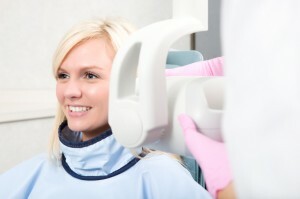 In response to the study, the ADA released a statement saying “the amount of radiation that we are exposed to from dental X-rays is very small compared to our daily exposure from cosmic radiation and naturally occurring radioactive elements.” The dental care association’s statement went on to discuss the benefits of dental X-rays as well as patient safety recommendations, including dentists using fast X-ray films or digital X-rays. Even before this study was released and before the hubbub began, your Dakota Dental dentists in Apple Valley had already proactively switched to using digital X-rays. •	First, digital X-rays use significantly less radiation. Because the electronic sensor used to capture the images creates very accurate images with very little exposure, the amount of radiation is cut by 80 to 90 percent. •	Second, digital X-rays are instantaneous. The moment the X-ray image is captured, it is displayed on screen—there is no waiting for film to develop and to confirm accuracy. •	Third, digital X-rays reveal a deeper level of detail beyond what can be seen on a traditional film X-ray. •	Fourth, digital X-rays are more environmentally friendly since film X-rays create much more waste. In using digital X-ray technology, your Apple Valley dentists at Dakota Dental are making dental services safer and more convenient for family dental patients. Experience the benefits of digital dental X-rays and regular dental care at Dakota Dental. From general dental work to dental emergency services, your Apple Valley dental clinic utilizes proactive, state-of-the-art dental care procedures to serve you well!